We have a Mexican restaurant that we love to visit. They fill their tacos with everything: brisket, pulled pork and many varieties of fish. It is from this restaurant TRUCK that I was inspired to make my own home version of a fish taco. You can use any kind of fish. 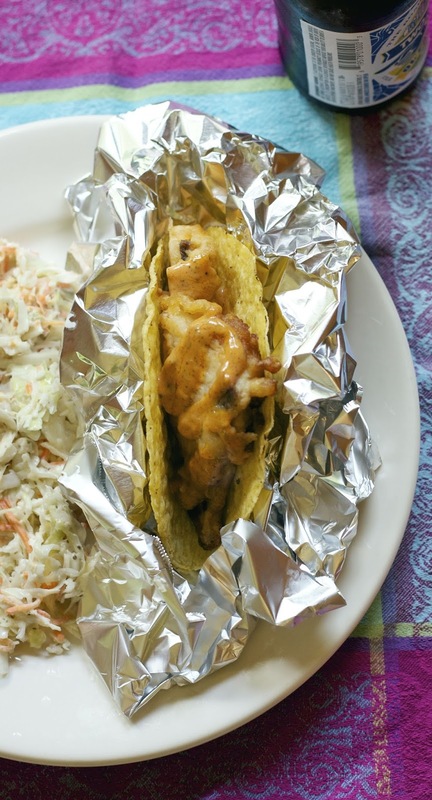 I keep frozen tilapia on hand, cod would work really well too with this recipe. Any type of firm white fish is great for frying because it doesn't fall apart. The key to a good fish taco is hot oil and a beer batter. I don't know exactly what the chemical reaction is when you mix beer with flour, but the result is an airy crisp coating around the fish. I used store bought crisp tacos so I wouldn't have to cook individual fresh tacos, but truly, if you have the time make soft tacos... they taste even more delicious than the crisp ones. 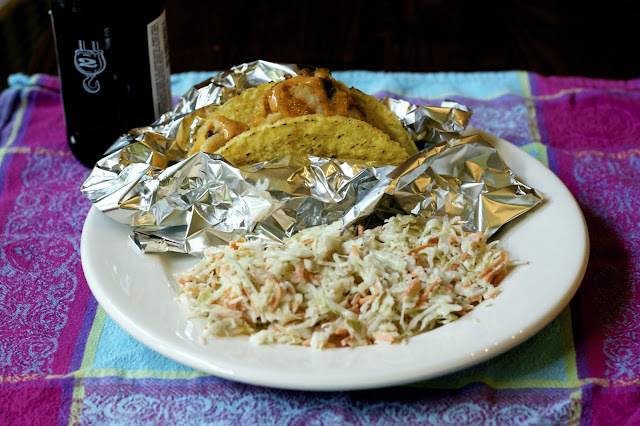 And don't forget to finish up the beer you bought to make the batter... a little cole slaw and beer goes great with these Quick Fish Tacos. 1) Wrap up taco shells with tin foil or put on a taco tray to hold them upright. Figure 2 to 3 tacos per person. Put the tacos in a 300 degree oven to warm them up. 2) In a large deep pan. I use a dutch oven. Pour about 1 inch of vegetable or canola oil and heat to 375 degrees. 3) Whisk the beer with the flour, paprika, salt and pepper. If the batter is too thick (hard to coat fish) add more beer. You don't want a runny batter but if it's too lumpy you can't coat the fish. 4) Put about 2 tablespoons of flour in a dish. 5) When the oil is hot (about 300 degrees) dredge the fish pieces through the flour, then put the into the batter covering well and then into the frying pan. 6) Do not move the pieces of frying fish for about 3 minutes or until you start to see the edges getting golden. Flip and fry for about 3 more minutes on the other side. You want very golden to brown pieces of fish. 7) Cook fish in batches don't over crowd the pan or you will cool the oil. As a piece of fish finishes cooking put it on a plate lined with towel paper. 8) When all the fish is cooked remove taco shells from the oven. 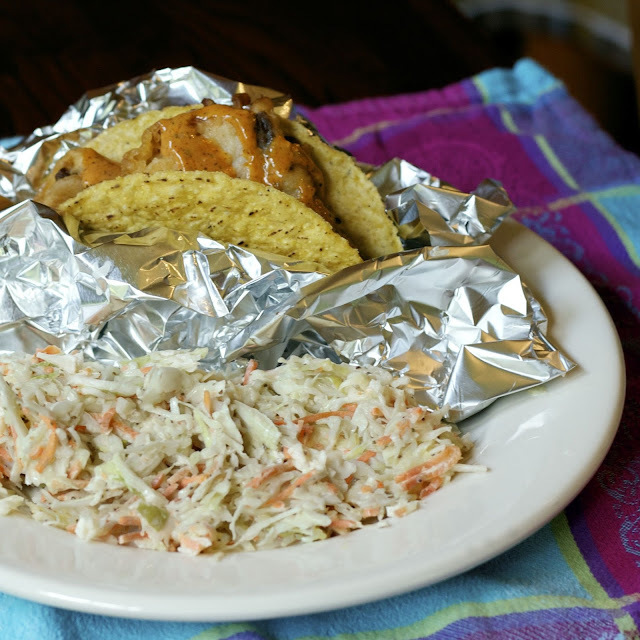 Fill them with fish and let folks garnish their taco with remoulade sauce and cole slaw. The beer batter of course is stolen from the classic British Fish-n-chips. I think I can do that. Thanks. The link didn't work in the previous comment...so trying again. These look so yummy! I gave a shout out and a link back to you in my "Saturday Morning Coffee Cafe" post this week. I came back into your site tonight to find this recipe. It looks delicious and perfect for a summer night. I will not only use a bottle of beer but I will drink one with my meal. With coleslaw. As long as the beer doesn't get wasted. A great idea for heating the tortillas and these tacos look fantastic! Hope you are having a great day and thanks so much for sharing with Full Plate Thursday. My husband would devour these!! Thank you so much for linking up at Tasty Tuesday! This post has been pinned on the Tasty Tuesday Pinterest board! I love having you and can't wait to see you next week!